The recent Batman: Noir release (a format presenting seminal Batman stories in black and white inks without any color) of writer Scott Snyder, artist Greg Capullo and inker Jonathan Glapion’s The Court of Owls has proven an excellent opportunity to revisit a story that has cemented its place as a Batman classic despite being less than a decade old. The new Noir formatting of the story is not exactly the second format I’ve encountered this story in. I read it first as individual comic books, then as a nicer pair of hardcover trades. There’s an excellent version that is just Capullo’s original pencils and, of course, the academic, oversized Absolute Edition. Anytime the opportunity arises I find myself eager to reencounter Snyder and Capullo’s first Batman collaboration in a different light, as I consistently find myself drifting back to the tale once or twice a year. With the exception of Christopher Nolan’s Dark Knight, which I saw a dozen times in the theater because I was a high schooler on summer vacation and the world was my oyster and time had no meaning, Court of Owls is the Batman story I interact with the most. There are plenty of Batman stories I love, but none that I inevitably meander back to with such frequency. DC Comics already regularly markets The Court of Owls as a Batman essential alongside the likes of Frank Miller’s Year One and The Dark Knight Returns, and Jeph Loeb and Tim Sale’s The Long Halloween, but more than perhaps any other Batman story, Court of Owls has the mythological backbone of a near-universal rite of passage. For those unfamiliar with The Court of Owls, the story concerns a Batman at the height of his prowess discovering an illuminati-like organization that has haunted Gotham’s past and is pulling the strings to manipulate the city’s future. Readers are introduced to a Bruce Wayne who can and does readily wax philosophic about Gotham. It is his city. He knows it to the marrow. He informs the reader of Gotham’s history, of Gotham’s architecture, of its heights and depths, and he does it with the sort of offhanded virtuosity one would provide an oral history of their closest friends and family. And then he discovers that that knowledge is at best incomplete, and at worst an elaborate façade. In The Court of Owls, Batman undergoes a rite of passage most, if not all, of us will confront at some point in our lives: the subversion of his perception of home. Court of Owls challenge Batman by calling into question the structural integrity of what he believe Gotham to be. The worst part? Nothing about Gotham City has actually changed. The threat Bruce Wayne stumbles upon is one that dates back centuries. The adversary he faces is ingrained in Gotham and has been for longer than he ever can be. In grand, mythological fashion, Batman’s undertaking in Court of Owls mirrors the sort of realization that comes with hearing the unabridged, adult version of the history of the town you grew up in, or with returning home after that first semester away from college to find everything so different and so eerily similar. It’s a story about our relationships with home, about how home can define us, betray us and strengthen us, about how even when everything we think we know about our home suddenly feels false the inherent truths we hold about our home can still ring true. In Court of Owls, Batman, like each of us, has to contend with those aspects of his relationship with Gotham that are concrete and those that are fluid and the fact that what makes those aspects concrete or fluid may be entirely out of his control. It’s a struggle that is gorgeously rendered by Capullo in the story’s unforgettable middle chapters (originally published as Batman #5 and #6) in which Batman is stalked through his new nemesis’ stalking grounds. I find myself returning to the Court of Owls time and time again because it so beautifully articulates and examines our relationships with home. It is Batman punching and kicking his way through the internal monologues we have when we return home for the holidays and wander through neighborhoods that suddenly seem so much smaller. It’s a batarang to that weird sensation of finding out some grown-up you knew as a kid is actually an utter jackass, or some mean old lady you rolled your eyes at was a saint. More than an excellent Batman story, the Court of Owls is an excellent human story, one that deals with the horrifying sensation of tectonic plates beneath our parents’ house shifting that we all find ourselves experiencing at one point or another. After wrapping up Superheavy, their final story arc on Batman, writer Scott Snyder and artist Greg Capullo (with inker Danny Miki and colorist FCO Plascencia) put a period at the end of their sprawling, five-year bat-sentence with one of the single greatest individual issues of their entire run. Batman #51, entitled “Gotham Is,” is at once a poignant, standalone Batman chapter and a deeply impactful series finale. If you just picked up Batman #51 on a whim because that psycho in Dawn of Justice seemed neat you’re in for a satisfying read. It’s an excellent standalone Batman story that provides equally tragic and uplifting insight into the character. But it’s as the finale to a five-year saga that Batman #51 really soars. “Gotham Is” calls back to 2011’s Batman #1, using a Gotham newspaper column featured in the first issue as a framing device. I’ve read that first issue and the subsequent Court of Owls story arc so many times in so many formats that by the end of the first page the last issue felt like a sort of homecoming. From there, a story about a mysterious power outage in Gotham weaves throughout the city touching on not only the characters and locations from throughout Snyder and Capullo’s run on the series, but also the various feats of literary and artistic strength that have elevated the run since 2011. Snyder uses character narration to directly, affectingly address the reader and Capullo’s detailed, architectural prowess is on full display in his depictions of everything from Gotham’s skyscrapers to its street lights. Throughout Snyder and Capullo’s time on Batman the book has always felt like something more than any other comic that ends up in a neat, alphabetized stack on my coffee table every Wednesday. Month after month each issue felt like an event. For me, there are movies and then there are Christopher Nolan movies. There’s television and then there’s Hannibal (or at least there was). There are comics and then there is Snyder and Capullo’s Batman. Batman #51 reaffirmed those feelings. Circling back through the characters, locales and events of the previous 50 issues it’s a finale that makes the entire saga Snyder and Capullo have told on Batman feel like a narrative free of the storied history of the character. From Court of Owls to Superheavy they’ve told a tale that, beyond being great Batman, is just great storytelling. Without ever having previously heard of Batman you could go from #1 to number #51 and you’d be taken on a complete, self-contained journey with compelling characters, engaging twists and turns, and a truly satisfying conclusion. The greatest strength of Batman #51, and Snyder and Capullo’s entire tenure on the book, is that it stands alone on its own merits as a story that greatly contributes to the 75 year old Batman canon but in no way depends upon it. It’s the kind of issue and the kind of run that make me wish I’d never heard of Batman so I could see him for the first time through this specific, glorious prism. Probably the highest praise I can think of to give Superheavy, the recent Batman story arc that concluded with last week’s Batman #50, is that it is a piece that could only have been made here and now by the current stewards of the Dark Knight. In the wake of a major assault on Gotham by the Joker, Jim Gordon, of “stop pointing that gun at my family” fame, is left to take to the mantle of the Bat. The ten issues that follow showcase a team (writer Scott Snyder, artist Greg Capullo, inker Danny Miki and colorist FCO Plascencia with guest artists Jock and Yanick Paquette) not just at the height of their technical abilities, but at the height of their creativity as well. Superheavy is full of vibrant monsters, lavish prose, precise architecture and seamless dialogue. But it’s not just the specific, well-oiled creative team that make Superheavy a Batman story that could never have been told before, it’s the story itself, a reaction to the lapsed relationship between low-income, minority communities and the powers put in place to protect them. Not a new problem, to be sure, but one that in the last few years has found its way to the forefront of the American dialogue. In reacting to the specific societal concerns of the day Superheavy puts forth a thesis on Batman that we wouldn’t have seen even five years ago when Snyder and Capullo first started their run on Batman. Superheavy dives head first into the idea that Batman is “more than just a man,” by stripping the Bat of the man and leaving Gotham City to decide what the symbol left behind means for themselves. Ultimately, even in a climate where law enforcement disproportionately fails specific communities time and time again, the symbol Gotham arrives at isn’t frightening, confrontational or vengeful. The Batman born here and now is an avatar of hope, aspiration and community. In 2016 The Bat isn’t a soldier in a one-man war on crime, it’s a beacon for others to follow. A validation of the hope that the world around us is not only worthy of improvement, but that it individually we have the power to be agents of that improvement. It’s not a Bat we could’ve gotten in 1966 or 1989 or 2008. It’s not a Bat we could have gotten in 2011. Snyder, Capullo and company have not only told another in a string of excellent Batman stories, they’ve told one that could only have been told by them and couldn’t have been told until now. Endgame, or, Happy Belated 75th Birthday Batman! Endgame, the major story arc in writer Scott Snyder and artists Greg Capullo, Danny Miki and FCO Plascencia’s Batman book during the character’s 75th Anniversary last year, initially had me the littlest bit weary. Plot details for the arc had been kept under wraps until the debut of the first issue but by the close of Batman #35 it was clear that the antagonist was the Joker, a character who, in clumsier hands, could easily, loudly steal the spotlight from the caped crusader on his 75th birthday. Fortunately, and unsurprisingly, the Snyder/Capullo Batman team didn’t turn in a crazy-for-the-sake-of-crazy Joker story. Much like Death of the Family before it Endgame doesn’t thrust Joker into the spotlight so much as use him as a spotlight to highlight Batman and, in this case, his tireless, decades-long mission. Endgame introduced a terrifying new fold into the Joker’s character – a bit of straight up hatred. After his last encounter with Batman the Joker returns spiteful and malicious. Despite the despicable cruelty the Joker has displayed over the years it’s almost always seemed to be in the name of random violence. The Joker is a force of chaos, a force of meaninglessness. Endgame gave the Joker spite and in doing so gave an avatar of seemingly unpredictable and pointless carnage purpose. That purpose is contradictory to Joker’s supposed core values and in succumbing to that which he rages so hard against, purpose, the Joker undermines himself and is philosophically defeated long before he and Batman come to blows. Furthermore, giving Joker such a specific purpose in Endgame highlights how the character has actually had a broader purpose all along – the pursuit of proving the purposelessness of it all. He’s a contradiction. He’s a smokescreen of terror and cruelty that at its core can’t hold up to even the slightest bit of intellectual scrutiny. His terrorism in support of meaninglessness gives him meaning. He is his own counterargument. His crusade is a joke. Go figure. Where Endgame triumphs, other than the very cool segment on jellyfish and the consistently fantastic art, is in showcasing just how flawed and broken the pursuits of Batman’s antagonists are and, in contrast, how sturdy and true Batman’s own 75 year old mission continues to be because Batman fights for meaning. He’s dressed head to toe in symbolism and his bread and butter is deriving significance from the exact kind of senseless violence the Joker so haphazardly hocks. Unlike the Joker, Batman has a philosophical center that holds up to scrutiny because it is inarguable. We can gleam meaning from our days, be they triumphant or tragic. It’s a sentiment that rang true in 1939 when Batman’s origins were first revealed in the pages of Detective Comics #33 and it’s a sentiment that rings true in the final panels of Endgame. All this is to say Endgame that while it might be the Joker on the cover of the Endgame graphic novel, it couldn’t be a more Batman-centric tale. Endgame was the perfect story to tell on the occasion of Batman’s 75th birthday. Now that I’ve said my piece regarding DC Comics’ universally-loathed, split-screen advertising strategy, and now that said advertising strategy seems to be over (at least for the time being) it’s a lot easier to reflect on the actual content being put out under the publisher’s new DC You banner. What DC’s books arguably lacked in the wake of their New 52 reboot at the end of 2011, and what Marvel has become prodigious in nailing down, is a sense of here and now. Where an issue of Marvel titles like All-New Captain America, Daredevil or Ms. Marvel often feels like a specific response to the cultural discourse of the day DC’s titles as of late have had a certain timelessness to them. DC’s New 52 titles often felt like reactions to themselves, insular examinations of the decades old history of their stable of characters. I adore Geoff Johns’ Justice League and Brian Azzarello and Cliff Chiang’s Wonder Woman and have zero hesitation strongly recommending them to any prospective reader, but aside from modern storytelling sensibilities nothing about either book screams of the world outside of your window. DC You aims to fix that and as of the start of the new line’s second month the publisher is right on target, telling stories that feel like they’re unfolding as you read them, rather than in some chronal literary vacuum. Not only has DC diversified their roster with books like Black Canary, Cyborg and Midnighter, they’ve started to tell stories that look outward into our world. This timeliness is particularly prominent in books like Action Comics, Green Arrow and Batman, all of which have entered into a conversation about authority and the role of law enforcement. The last story arc in New 52 Action Comics was a zombie yarn examining Superman’s ties to his hometown in Kansas. 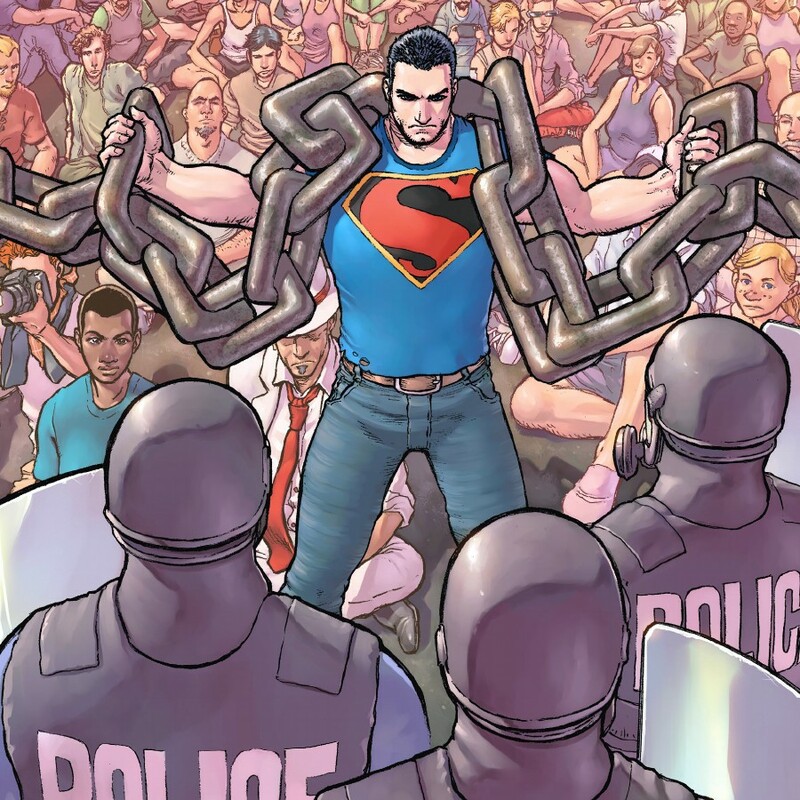 Conversely, in last week’s Action Comics #42 Superman is literally a barricade between an enraged public on the verge of rioting and a heavily armed police force wielding batons and riot shields. Artist Aaron Kuder concocts thrilling, captivating imagery that makes the 75 year old character feel like he was born in 2015. Writer Greg Pak examines both sides of a community on the brink, illustrating just how volatile and multifaceted a situation the encounters between authority and citizenry we see on the nightly news can be. By the end of the issue my stomach hurt. 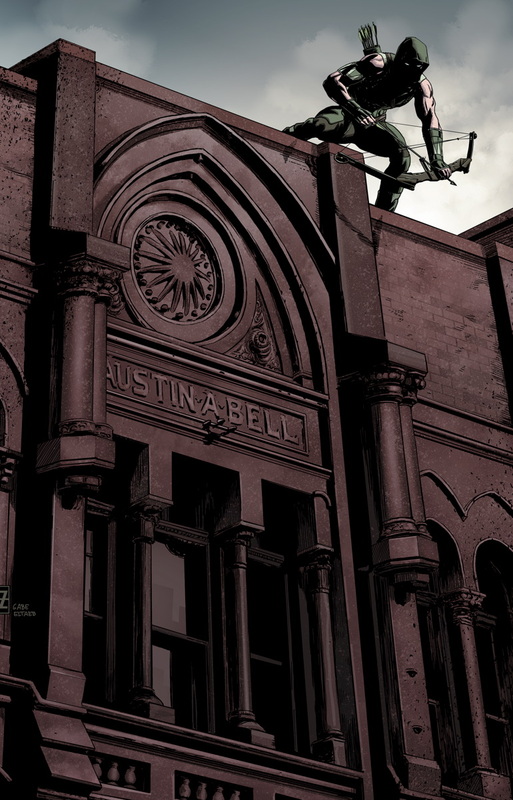 The last I read of Green Arrow was Jeff Lemire and Andrea Sorrentino’s fantastic run, which concluded last September and saw Oliver Queen trotting the globe to uncover the mysteries of The Outsiders, an age-old organization comprised of clans with ideologies surrounding various primitive weapons. An awesome adventure story, but one that again relies on interaction with the fictional world and mythology of the title character, rather than the world we the readers occupy. Now, under the stewardship of writer Ben Percy and artist Patrick Zircher, Oliver Queen is going up against racial profiling drones that are specifically targeting African American and low-income citizens. Worse still, Oliver has found out that through his own disinterested approach to managing his company he’s inadvertently supported the development and deployment of the drones and their systematic discrimination. So while a mysterious, white as the moon villain assaults a group of peaceful protestors Oliver grapples with the fact that he has unknowingly helped prop up a system that actively disenfranchises whole segments of his community. Green Arrow has gone from taking on the spear clan and Count Vertigo to battling white privilege and institutionalized oppression. Even Batman, a book that has managed to often enough buck the New 52’s insular nature with threads exploring mental illness and modern cultural fears, has taken a further step into our world in its questioning of authority. Scott Snyder and Greg Capullo’s latest arc, Superheavy, explores law enforcement and its relationship with citizens via a Batman who works inside the law enforcement system. Yesterday’s Batman #42 saw the new Dark Knight admit that there are segments of Gotham in the lowest economical bracket that are time and time again failed by the system that is supposed to protect and support them, acknowledge the injustice of that disparity and actively try to fix it. The writers and artists at DC have spent the decade putting out some truly extraordinary books that will no doubt be remembered for years to come for their literary prowess and craftsmanship. But with stories like the ones now being told in Action Comics, Green Arrow and Batman, DC is also releasing material that readers will be able to return to as a window into the cultural landscape of 2015, much the way Frank Miller’s Dark Knight Returns can provide some insight into the cultural climate of 1986. The DC You banner is becoming synonymous with stories that are specifically not timeless. And that’s a good thing. My good for nothing ASUS computer has finally been repaired! You know, the one that’s less than a year old? So say goodbye to listening to me chatter at you through a phone and say hello to me telling you all about my weekend at 2014 Baltimore Comic Con.